Loosen a tight knot with effort. Tying a knot that stays securely tight can be of paramount importance in some situations. Because knots can be extremely important for things like rock climbing or boating, for example, learning to tie knots properly can serve you well. After tying a knot, you may need to get a tight rope knot loose at some point. When this occurs, try a trick or two to loosen the rope fibers and untie the knot. Wait until the rope dries, if possible. Wet rope is more difficult to untie than dry rope. Examine the knot carefully to understand where you should begin working at it. If you can find a loop that moves a little, this is an effective place to begin working at the knot. Twist the parts of the rope that extend out from the knot. Move the rope back and forth, twisting it vigorously. 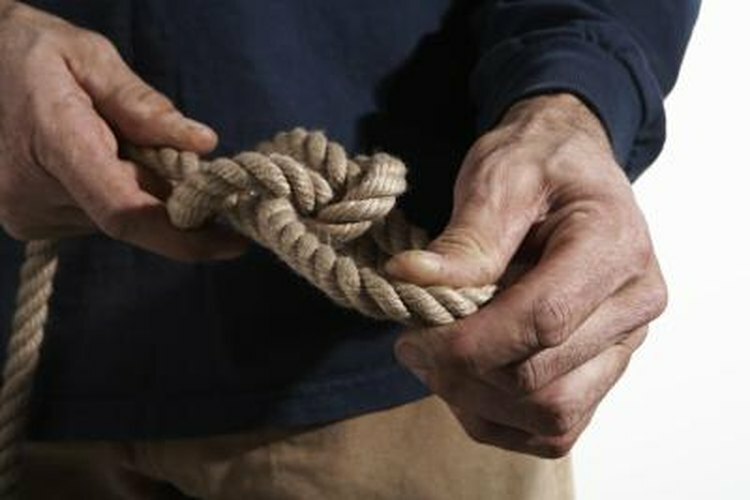 Push the ends of the rope up into the knot after twisting. Often, this technique can loosen the knot. Work at the knot as much as you can with your fingers until you cannot make any more progress. Place the knot on a hard surface, such as concrete. Tap on the knot lightly with the hammer. Do not hit the knot hard -- use light tapping only. Turn the knot over so the other side faces up and tap it again one or two times. Pick at the knot with your fingers to see what parts you loosened with the hammer. Work at the knot as much as possible, untying the loosened rope. Insert the tip of a pointed metal object into the knot to loosen a loop. A screwdriver or letter opener may help you loosen the knot by moving the tool around inside the knot. Remove the tool and continue working at the knot to loosen and untie it. How Do I Tie a Braid to a Monofilament?